All freeCodeCamp Moderators are community-wide moderators. That means that we trust you to oversee any of these places. This said, you can serve as a moderator in whichever places are of the most interest to you. Some moderators just help out on GitHub. Others just help out on the forum. Some moderators are active everywhere. The bottom line is that we want you to enjoy being a moderator, and invest your scarce time in places that are of interest to you. As a moderator, temperament is more important than technical skill. Listen. Be Helpful. Don’t abuse your power. freeCodeCamp is an inclusive community, and we need to keep it that way. We have a single code of conduct that governs our entire community. The fewer the rules, the easier they are to remember. You can read those rules and commit them to memory here. We are currently receiving hundreds of new pull requests each day as part of Hacktoberfest 2018. Thousands of contributors are making their first open source contributions, and they’re helping the freeCodeCamp community in the progress. Why is TravisCI taking so long to build the code? TravisCI is working hard to build the code for each pull request and make sure it doesn’t have any errors or failing tests. This said, we are currently receiving a volume of pull requests that is likely unprecedented in GitHub history. As new pull requests come in, TravisCI queues up builds. As a result, TravisCI is running several hours behind. Most new pull requests will have an orange dot beside them for several hours, until TravisCI builds them and returns either a green checkmark (if the build passes) or a red x (if the build fails). So instead of trying to QA the newest pull requests, use this link to browse pull requests that have passing builds. How do I run the codebase on my local computer? At the moment it is quite difficult to run the codebase locally. We’re making some structural changes to make this easier in the coming weeks. In addition to Arabic, Chinese, Portuguese, Russian, and Spanish, is freeCodeCamp being translated into additional languages? Eventually. For now these are the only languages that we’re translating the curriculum and guide into. Note that if people submit translations of either the README.md or the CONTRIBUTING.md, we will accept those in any language. Contributors should create files in the /docs folder. Which versions of these world languages are we using? There are many versions of each of these world languages - most of which can be understood by speakers of other variants. We should not strictly enforce one local variant over another. As nice as it would be to have regional versions of different languages, this isn’t practical for our community at this time. At the same time, we don’t want to be overly specific about pull requests. For example, even though freeCodeCamp uses American English, we don’t reject pull requests just because they have British English spellings or British English terminology. Moderators have the ability to close issues and accept or close pull requests. Pull Requests (PRs) are how contributors submit changes to freeCodeCamp’s repository. It’s important that we perform Quality Assurance (QA) on pull requests before we decide whether to merge them or close them. Guide Edits These are text changes to guide articles. You can review these right on GitHub and decide whether to merge them. If these pull requests seem to improve an article - by fixing grammatical or factual errors, adding additional details, or adding relevant (non-affiliate) links or images - you should err on the side of merging them. Note that if someone tries to link to a paid resource, you should tell them to instead review it in the reviews section of this forum. I am closing this pull request. Please add links and other details to the challenge’s corresponding guide article instead. If you think I’m wrong in closing this issue, please reopen it and add further clarification. Thank you, and happy coding. Challenge Code Edits These are changes to the code in a challenge - the Challenge Seed, Challenge Solution, and Test Strings. These pull requests need to be pulled down from GitHub and tested on your local computer to make sure the challenge tests can still be passed with the current solution, and the new code doesn’t introduce any errors. Some contributors may try to add additional tests to cover pedantic corner-cases. We need to be careful to not make the challenge too complicated. These challenges and their tests should be as simple and intuitive as possible. Aside from the algorithm challenges and interview prep section, learners should be able to solve each challenge within about 2 minutes. Codebase Changes These code edits change the functionality of the freeCodeCamp platform itself. Sometimes contributors try to make changes without much explanation, but for code changes we need to make sure there’s a genuine need for the change. So these pull requests should reference an existing GitHub issue where the reasons for the change are discussed. Then you can open the pull request on your computer and test them out locally. After you’ve done so, if the changes look good, don’t merge them quite yet. You can comment on the pull request saying “LGTM”, then mention @bouncy so he can take a final look. First of all, when you choose a pull request to QA, you should assign yourself to it. You can do this by clicking the “assign yourself” link below the “assignees” part on the right hand column of GitHub’s interface. Depending on the type of pull request it is, follow the corresponding rules listed above. Before merging any pull request, make sure that GitHub has green checkmarks for everything. If there are any X’s, investigate them first and figure out how to get them turned into green checkmarks first. Sometimes there will be a Merge Conflict. This means that another pull request has made a change to that exact same part of that same file. GitHub has a tool for addressing these merge conflicts right on GitHub. You can try to address these conflicts. Just use your best judgement. The pull request’s changes will be on top, and the Master branch’s changes will be on bottom. Sometimes there will be redundant information in there that can be deleted. Before you finish, be sure to delete the <<<<<<, ======, and >>>>>> that Git adds to indicate areas of conflict. If the pull request looks ready to merge (and doesn’t require approval from @bouncy), you can go ahead and merge it. Be sure to use the default “Squash and Merge” functionality on GitHub. This will squash all the pull requests commits down into a single commit, which makes the Git history much easier to read. You should then comment on the pull request, thanking the contributor in your own personal way. If the pull request doesn’t look ready to merge you can politely reply telling the author what they should do to get it ready. Hopefully they will reply and get their pull request closer to ready. Often, a pull request will be obviously low effort. You can often tell this immediately when the contributor didn’t bother checking the checkboxes in the Pull Request Template, or used a generic pull request title like “made changes” or “Update index.md”. There are also situations where the contributor is trying to add a link to their own website, or include a library they themselves created, or has a frivolous edit that doesn’t serve to help anyone but themselves. Thank you for opening this pull request. This is a standard message notifying you that we’ve reviewed your pull request and have decided not to merge it. We would welcome future pull requests from you. If you need a second opinion on a pull request, go ahead and leave your comments on the pull request, then add the “discussing” label to the pull request. freeCodeCamp is an active open source project. We get new issues every day, all of which need to be triaged and labeled. Code Help Requests, which people have mistakenly created GitHub issues for. If someone is asking for help, paste the following message, then close the issue. This is a standard message notifying you that this issue seems to be a request for help. Instead of asking for help here, please click the **“Help”** button on the challenge on freeCodeCamp, which will help you create a question in the right part of the forum. Volunteers on the forum usually respond to questions within a few hours. If you think I’m wrong in closing this issue, please reopen it and add further clarification. Thank you and happy coding. If it’s a simple change to an existing challenge, flag as help wanted and, optionally, as first-timers-only. Use other tags as appropriate. If the issue is more significant, flag as bug. If there is any ambiguity as to the proper course of action on an issue, feel free to tag @raisedadead on the issue get his opinion on it, then add the Discussing label. Duplicate Issues If an issue is the same as another reported issue, the prior reported issue should take precedence. Flag as Duplicate, paste the following message replacing #XXXXX with the issue number, then close the issue. This is a standard message notifying you that this issue appears to be very similar to issue #XXXXX, so I am closing it as a duplicate. This is a standard message notifying you that the problem you mentioned here is present in production, but that it has already been fixed in staging. This means that the next time we push our staging branch to production, this problem should be fixed. Because of this, I’m closing this issue. Give a short explanation of why this is bikeshedding, a form of Parkinson’s law of triviality, so I’m closing it. Merge-conflicts and Stale PRs that have not seen any activity from anyone for 21 days (3 weeks from the last activity), we can close them in an automated/bot script or the moderators themselves. Activity is defined as: Comments requesting an update on the PR and triages like status: update needed label etc. If the OP ask for additional assistance or even time, the above can be relaxed and revisited after a response is given. In any case the mods should use their best judgement to resolve the outstanding PR’s status. Though you will have write access to freeCodeCamp’s repository, you should never push code directly to freeCodeCamp repositories. All code should enter freeCodeCamp’s codebase in the form of a pull request from a fork of the repository. Also, you should never accept your own PRs. They must be QA’d by another moderator, just like with any other PR. If you notice anyone breaking the code of conduct on GitHub issues, or opening pull requests with malicious content or code, email [email protected] with a link to the offending pull request and he can consider banning them from freeCodeCamp’s GitHub organization entirely. As a Moderator, you help keep our community an enjoyable place for anyone to learn and get help. You will deal with flagged posts and handle spam, off-topic, and other inappropriate conversations. Someone has posted a pornographic or graphically violent image. Someone has posted a link or code that is malicious in nature, and could harm other campers who click on it. Someone has flooded a thread with lots of spam messages. You can ask questions and report incidents in the in the staff forum section. Posts or topics that seems to be in the wrong place, can be re-categorized or renamed to whatever would be appropriate. In exceptional circumstances, it may be appropriate for a moderator to fork a discussion into multiple threads. Again, if you have any problems or questions, make a post with your actions in the Staff category, and tag another moderator if you want them to review your moderating actions. If you see anything that seems to break our Code of Conduct, you should delete it immediately. Sometimes people will post things that they think are funny. They don’t realize that what they said or what they shared could be interpreted as offensive. In these cases, their post should be deleted, but the person who posted it doesn’t necessarily need to be banned. By getting their post deleted, they will hopefully come to understand that what they posted was inappropriate. But if it is an egregious offense that can’t reasonably be attributed to a cultural difference or a misunderstanding of the English language, then you should strongly consider blocking the member from the Facebook group. Make sure it was intended to violate the Code of Conduct. Not all violations of the CoC were intended as such. A new camper might post a large amount of code for help, not knowing that this can be considered spamming. A friendly request to use services like Codepen or Pastebin next time, is sufficient in these cases. Ask yourself if the offence warrants a ban. Keep in mind that a ban is a pretty severe punishment. It can put campers on the offence and cause a lot more trouble than needed. Sometimes words can be far more effective and keep everyone happy in the long run. Do you think you can solve the issue by talking privately with the camper? Perhaps a kick from the room to send a clear message will do? If you decide to ban the offending camper, don’t warn or threaten them. Instead, quietly ban them from the room(s), including the Admin room. This is a standard message notifying you that I had to temporarily ban you from freeCodeCamp's chat rooms. I am a moderator acting on behalf of our open source community. I can consider unbanning you, but I need you to do something first. 1. Read our [**Code of Conduct**](https://code-of-conduct.freecodecamp.org/). 2. Please confirm that you've read it. 3. Explain to me why you think I should unban you. I’ve unbanned ` @username `. I sent them the Code of Conduct. They just today realized they were banned and apologized for what they did. Based on the offenders reply, the moderator will decide whether to unban the offending camper. If they seem respectful and apologetic, the moderator can unban them. As a matter of policy, moderators will be polite during this process, no matter how poorly the offending camper has behaved. This only works for that single room, so you may need to ban them more than one place. If a camper continues to jump from room to room causing problems, moderators can request a global ban in the admin room. Someone has flooded the chat with lots of spam messages to such an extreme extent (usually involving bots) as to render chat completely unusable. In all other situations - even situations where the code of conduct is violated - Moderators should not delete the message as these are an important historic record. Don’t use @/all under any circumstances! Every single person in that chat room will get a notification. In some cases, tens of thousands of people. Instead, if you want people to see an announcement, use a heading text size. You can do this by putting a # in front of your first sentence. Moderator: @username Please use Codepen or Pastebin when posting large amounts of code. Moderator: @username Please use Codepen or Pastebin when posting large amounts of code, because it disrupts the chat for everyone and could be considered spamming according to our Code of Conduct. Do not see yourself as above the community. You are the community. And the community has trusted you to help protect something rare that we all share - a welcoming place for new developers. If you brag about being a moderator, people may feel uneasy around you, in the same way that people may feel uneasy around a police officer, even if they’re doing nothing wrong. This is just human nature. If you disagree with the action of a moderator, talk with them in private, or bring it up in mod chat. Never override a ban, and never contradict the other moderator(s) publicly. Instead, have a cool-headed discussion in mod-chat, and convince the moderator that they themselves should reverse their ban, or change their point of view. Remember: we’re all on the same team. We want to dignify the role of moderators and present a unified front. We have a room for moderators only. Use it! If you feel uncomfortable with how to handle a certain situation, ask other moderators for help. If you think something should be discussed, do it. You’re part of the team and we value the input of every team member! Even if you totally disagree with anything in these guidelines or the Code of Conduct! If you’re not going to be active as a Moderator for a while due to vacation, illness or any other reason, make sure to let the others know in the moderator room. This so we know if we can count on you or not. Have you been contributing to our community, and desire the additional power/responsibility that comes with being a moderator? Gather evidence that shows your helpfulness on GitHub issues, and/or helping campers on Gitter and our forums, and email it to [email protected]. If you are approved, we will add you to our Moderator Team. After you’ve been accepted as a moderator, you will receive a Github repository invitation. You’ll need to head over towards FCC Repository Invitation to be able to accept the invitation. This is required for us to be able to give you your Moderator status. This is a standard message notifying you that, since you don’t seem to have been an active moderator recently, we’re removing you from our Moderator team. We deeply appreciate your help in the past. If you think we did this in error, or once you’re ready to come back and contribute more, just reply to this message letting me know. Anyone is welcome in the Contributors room. It is the designated chat room for moderators and other campers who are contributing to our community in any number of ways, including through study groups. Our assumption is that contributors will read anything in this room that directly mentions them with an @username, or is directed to @/all. Everything else is optional. But feel free to read anything anyone posts in there and interact. You may be approached by organizations who want to partner or co-brand with freeCodeCamp in some way. Once you realize that this is what they’re after, please stop talking to them and tell them to email [email protected]. He get proposals like this all the time and is in the best position to judge whether such a relationship will be worth it for our community (and it rarely is). 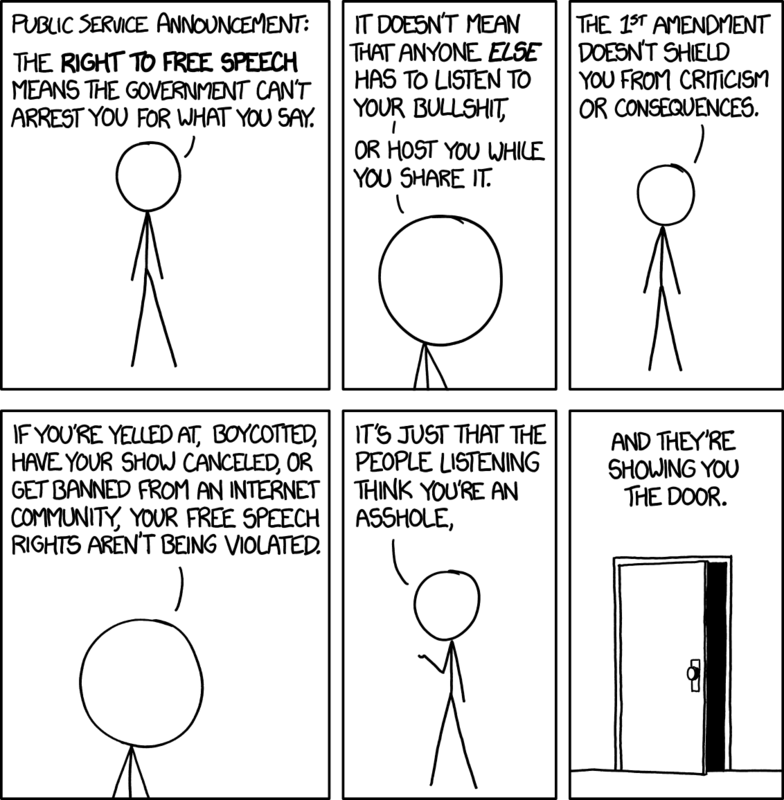 This XKCD comic perfectly summarizes most communities’ thoughts on free speech. 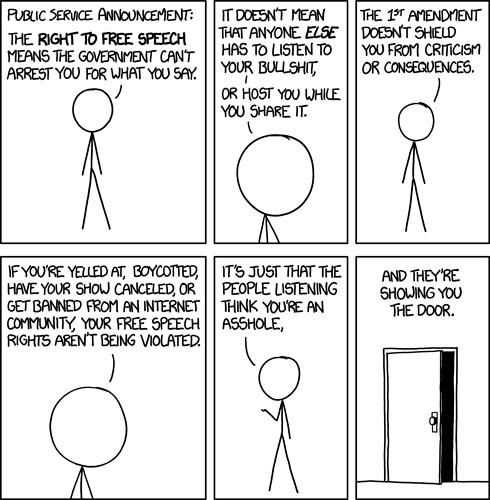 So if someone defends something they’re saying as “free speech” feel free to send it to them. Thanks for reading this, and thanks for helping the developer community!